Have you ever found yourself in a critical situation that got worse and worse and finally escalated? How can you take control of such situations? How can you avoid the escalation and turn things around? I enjoy motorbike riding. It frequently happens that riders suddenly lose their confidence in a corner, thinking they have come in too fast. Instinctively they look to edge of the road – and exactly that’s when they start running wide, panic, and perhaps lose control completely. In fact I was told that most of the motorbike accidents in which no third party is involved happen in corners, and that investigations showed that physically the speed of the bike was actually not too high. The riders could have prevented the accident easily, hadn’t they panicked. What these riders didn’t know is the first and probably most important lesson I have learned on the racetrack: where you look is where you go! I went to a track training and had difficulties in a tricky left hand corner. Graham, the owner of Highsidetours, observed me and then taught me to overcome my natural instinct and to look further ahead to the corner exit, to where I want to go. And it was just amazing: instead of staring at the curb (and watching it come closer at an incredible speed), I turned my head further to the left – and the bike followed like magic! Since then, I have consciously reprogrammed myself, and whenever I am in a tight situation on the road I simply adjust my view, I shift my focus. 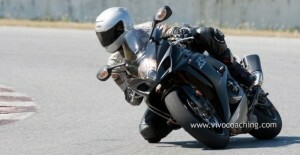 A new reflex that has taken my riding skills to the next level and made me a much safer rider. You may have experienced similar circumstances when driving a car on the road: there is an obstacle on the road, you watch it while trying your best to avoid it – and then you hit it. The trick is not to look at the obstacle, but at the escape way. Play this game and try it: if you look at some spots on the road surface, you will run over them with your car or bike. Instead, if you look at the empty spaces around them you will easily pass the spots. Now that you know how to survive on the racetrack and on the road, how do you apply this to your every day life situations? You simply use the same trick of shifting your focus. When you constantly look at a problem, you will hit it! Look at the way out. What is the solution? Let’s say you are having an argument in a business meeting or with your spouse. Things start getting emotional. Stop looking at the disaster, look at the solution! You may as well tell yourself that this situation is not that important, not life-threatening, and think of what it is that truly matters in your life. Focus on your long term plan for your life. There are other situations in which you can apply the race track knowledge. E.g. when you sit alone at home thinking about your problems and all the things that could possibly happen. This is almost a guarantee for things going wrong indeed! Instead, better look at all the possibilities right in front of: you will automatically mobilize your energy to move yourself forward to a positive future. Trust me, it works. Practice makes the master: you have to get used to breaking the old pattern of following your negative thoughts into escalation. You need to replace the old habit consistently with your new habit of focusing on the way out, and soon you will notice the quality of your life improving. Enjoy being in control of your life! Very nice, Dr. G. Very clear example so we can “get it” and use it. Always enjoy your thoughts. Deb B.
Deb, Thanks for your kind feedback. Glad to see that what I write can be useful. Dr. G, it `s always useful to share your thoughts. Wise words and an interesting read. Looking forward to your next post. Thanks everybody for your nice comments! Those looking forward for future posts, anything in particular you would like to read about?